Beautiful ladies vie for supremacy in this stylish, hypersexualized fighter. Your current favorite fighting game might have its share of attractive women, but can they produce giant bombs, attack with prehensile hair, or pull their own heads off for ranged attacks? The cast of Skullgirls can. Fighting fans have been keeping an eye on this game ever since its announcement, and for good reason. This beautifully-animated 2D fighter is small and lightweight enough to be released as a downloadable title, but may well provide enough depth and charm to work its way into the tournament scene. Representatives from Autumn Games gave me a chance to experience the game firsthand at New York Comic Con 2011, and it was definitely not a typical current-gen fighting game. 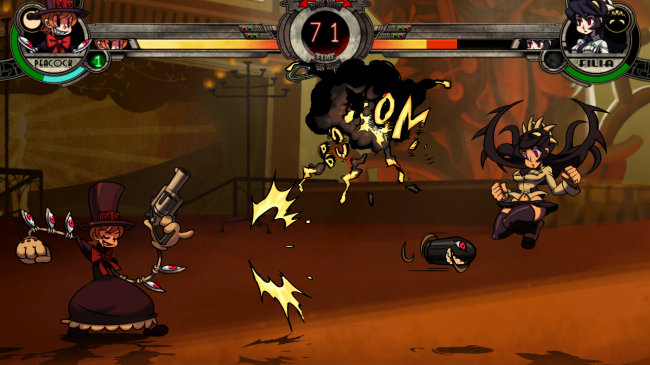 Imagine the gameplay of Marvel vs. Capcom 3, the art style of Scott Pilgrim, the animation of Odin Sphere, and the sexualization of Bayonetta all rolled into one game, and that's pretty much Skullgirls. The initial character roster is slim, but varied. During the hands-on demo, I had a choice of five different characters, including Peacock, a maniacal creation who looks like a mix between Felix the Cat and the Mad Hatter, Parasoul, a leggy redhead armed with an umbrella, and Ms. Fortune, who literally yanks her own noggin off to assault foes. In a fairly major departure from convention, though, you can actually choose how many girls to bring to battle: three weaker fighters, two balanced fighters, or one strong fighter. The game is balanced for all different kinds of matches, so players will be covered whether they want to fire off tag team combos or perfect a single skill set. Once the match starts, things fall into a more familiar routine. Each combatant has access to a number of weak, medium, and strong attacks that they can combine to wreak melee and ranged havoc. From what I played, the starting characters are well-balanced, and especially fun to watch in action. Peacock smiles menacingly as she hurls bombs from across the screen, while Cerebella's enormous golem arms smash enemies with satisfying weight. Nothing strays too far from fighting game convention, save for the welcome addition of a system to prevent game-breaking infinite combos or repetitive cheap shots. After a player has used the same move for a while, it will lose all effectiveness, forcing her to switch up her strategy. The gameplay sounds pretty standard on paper, but seeing it in action is a whole different story. Characters move and fight with incredible fluidity, making each action feel smooth and tightly-controlled. 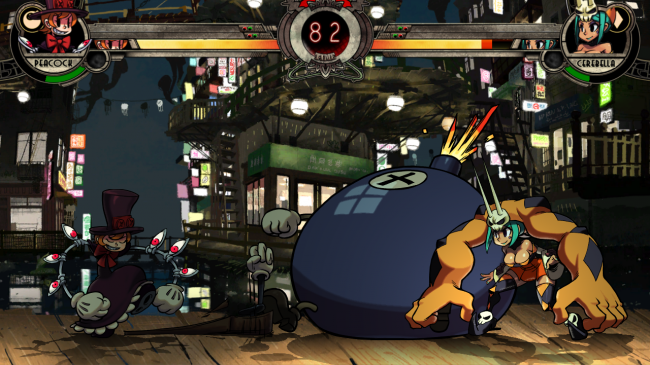 The biggest draw of Skullgirls is definitely its aesthetic. While you'd never know from looking at it, the game actually utilizes a 3D engine, but renders a vibrant, lively 2D spectacle. Playing the game is akin to watching a great cartoon, complete with over-the-top sound effects and a color palette that can range from a nostalgic monochrome to a garish rainbow. The animations are especially impressive. Characters and backgrounds are comprised of three different layers of artwork and a highly-adjustable color map, which allows for smooth and stylish character movements for everything from walking to self-decapitation. I didn't learn too much about the story mode, save for the fact that it justifies the all-female cast. While male fighters will arrive via DLC, the central narrative involves an artifact that can grant wishes only to women. The developers want to eventually tell other stories in this world, but it will depend on how well the game sells. One immediately noticeable thing about the cast is that with only one exception, the initial roster of fighters is sexualized to the point of absurdity. Bare legs, ample cleavage, and generous pantyshots are the rule, and the lack of any male combatants serves only to reinforce the female focus. 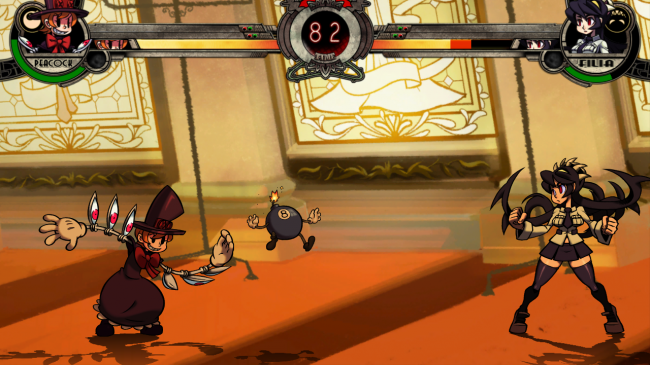 Does Skullgirls want to bring more women into the fighting genre, or sell itself via male appeal? The answer, it turns out, is neither. The lead artist has simply been drawing these characters for years, and they were the designs he wanted to incorporate into the game. "Women like [the game] so far," said Peter Bartholow, a community manager at Autumn Games, and pointed out that the over-the-top sexuality comes from the same semi-satirical vein as Bayonetta. Not only that, but the whole team fully supports the art design: Bartholow explained that the lead animator on Skullgirls, a woman, is responsible for the special attention paid to the design and animation of each character's breasts. 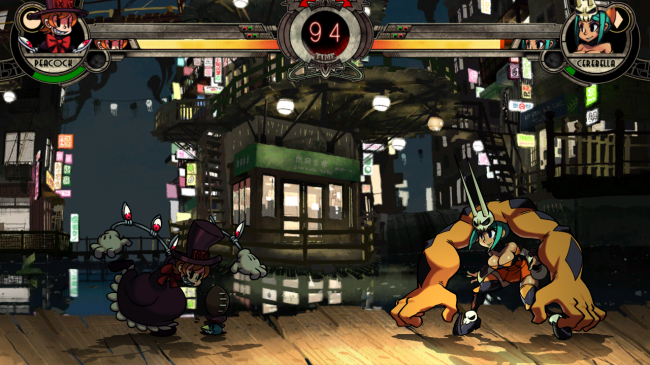 Ultimately, the goal of the Skullgirls team is to "create a tournament-grade fighter" that's also accessible enough to bring newcomers into the genre. 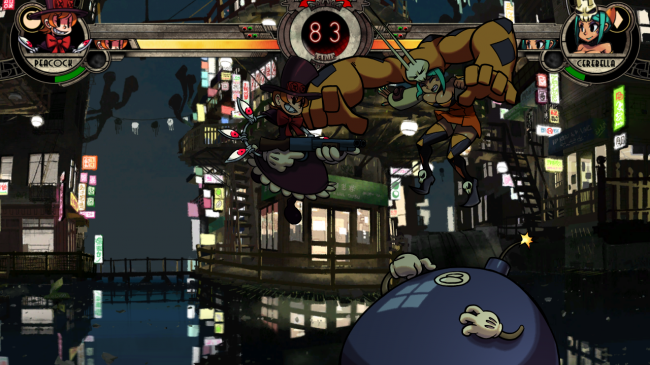 This may sound like a tall order, but Skullgirls just might have the aesthetic, the game balance, and the quirkiness to pull it off. Expect an XBLA and PSN release early next year with a possible Steam release coming "later."